It has been a long time since I have made stir fried vegetables at home. It was a common request by my father in law to make some of it along with fried rice and spring rolls. A visit to one of the greengrocers in Nairobi for just strawberries and I nearly bought the whole shop. Fresh, crunchy vegetables and the first thing that came to my mind was stir fry vegetables. I made some noodles to go along with it as my hubby loves noodles. Any combination of vegetables can be used for stir fries and its quick and healthy. Some Chinese restaurants in Kenya serve chinese dishes loaded with cornflour. They presume that a thick sauce with loads of cornflour makes the dish appealing. I hate the cornflour taste. Some restaurants charge the earth for a dish and use loads of cabbage. I would recommend Bangkok Restaurant to anyone visiting Nairobi. They are the best. The vegetables are crispy, fresh and tasty. None of the dishes are overly spiced. Till you can reach a nice Chinese restaurant, try out this stir fry and play around with the spices according to your taste. Blanch the baby corn, french beans and snow peas separately in boiling water. Plunge them in cold water to stop the cooking. Drain and keep it on the side till required. Keep the sauce ready by mixing all the sauce ingredients. Add sesame seeds, cashew nuts onions, garlic and ginger to it and stir fry for 15 seconds. Add the carrot slices, baby corn slices, french beans and stir fry for 30 seconds. Keep on stirring the vegetables. Add mushrooms and stir fry for a further 15 to 30 seconds. Add bean sprouts and mix. Push all the vegetables to the side of the pan. Add the sauce in the empty space created. As soon as it begins to bubble, mix in the vegetables. Garnish with spring onions and serve with noodles or rice. Add salt and 1tsp of oil. Add noodles and cook till just done. The noodles I used took just 3 minutes. 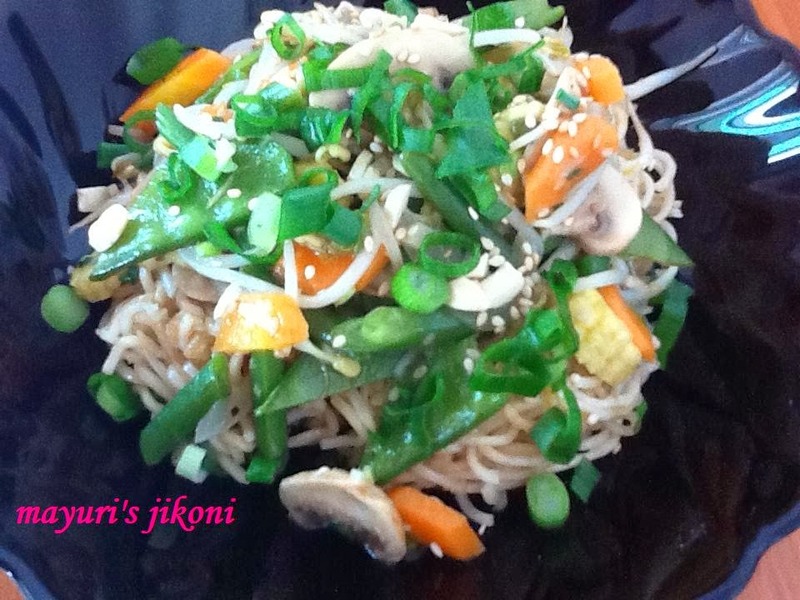 You can stir fry the noodles with in oil and soy sauce or just serve them plain. Use any vegetables of your choice like broccoli, celery, chinese cabbage etc. Stir fry the vegetables just before serving. You can blanch french beans, snow peas and baby corn ahead.